Why a formal shaped pond needs a box welded pond liner? A formal, ornate, symmetrically designed pond with clearly defined edges is the perfect choice for those who want a focal point in their garden. Formal ponds tend to be square, rectangular, circular or hexagonal in shape with vertical sides. They can either be built into the ground or raised. The installation of a pond liner is recommended to retain water but should ideally be fitted eliminating creases, which can easily distract attention away from the formal look. A box-welded or tailored-to-fit pond liner offers a flawless option to ensuring optimal water retention. A box-welded pond liner is fabricated to the exact size and shape of your pond, which can then quite simply be dropped in for a perfect fit. Formal ponds take inspiration from classic architecture. They are built to a symmetrical design where perfectly straight or arched lines are used to create the shape. The following images show the symmetrical shape of a formal pond made water-tight by the installation of a box-welded or made-to-measure pond liner. 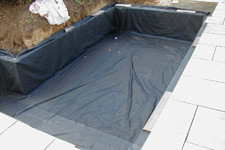 A box-welded pond liner is fabricated from either Butyl or Epalyn rubber to the exact size and shape of the pond so that when installed it ‘fits like a glove’ with no folds or creases to distract from the formal, precise shape of this type of pond design. The key feature of a formal pond is the way it brings the sky and clouds down to the ground. 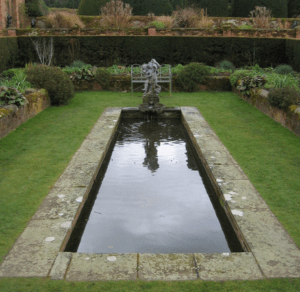 Where a formal pond is positioned is very important to enable it to cast the perfect reflection.The edges of a formal pond are clearly defined using materials such as brick. flagstone or tiled. Edging material also serves to secure the box-welded pond liner in place. Feeling inspired? if you are, contact Liners Online to order a made-to-measure pond liner and for any additional advise you may be searching for with regards to the build and installation. This entry was posted on January 10, 2019, in Garden ponds. Bookmark the permalink.